*Please keep in mind that this is information is specific to North Carolina law. Contact an attorney in your state or your state’s alcohol beverage commission’s office to find out specific information about this. 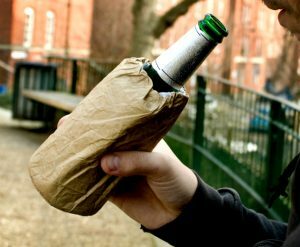 People use the term “brown bagging” a lot, but when it comes to alcohol it has a very specific meaning-one that may not be intuitive to everyone. The above establishments can apply for a brown bagging permit in only NC counties with laws forbidding the service of mixed alcohol beverages. The concept of brown bagging commenced because it was illegal in NC to have a cocktail in a restaurant from 1908-1967. A customer who wanted a mixed drink in a restaurant would have to supply his own liquor (hence bring the liquor into the restaurant), and the restaurant would provide the glass, ice, and a mixer. In 1978 the law changed (for the better), and NC restaurants could prepare and sell its own mixed drinks. Thanks for informing us about this. This is super helpful.